In light of the campaign against the proposal of building inappropriate tower blocks in Clapham Junction, I have requested the opinion of your colleagues of the adjacent wards. I have also sent you specific questions that your colleagues have addressed in appropriate ways. Your absence at recent events involving significant changes to the borough have raised concern among voters. Important decisions need to be made concerning our future that will dramatically impact our daily lives and change the neighbourhood of which we are all members. As elected officials, your responsibility to represent our interests is clear, yet by your very absence it seems that our interests are not your top priority. On the numerous occasions where elected officials from neighbouring communities have taken the time to discuss the many concerns facing Clapham Junction, your absence was noticeable and I must inquire as to why it is so difficult to engage you, our elected representative, in a discussion of such great importance. Early in the beginning of our campaign we were pleased that your Conservative Colleagues in Northcote ward such as Cllrs Johnson, Beddows and Dawson, published in the Wandsworth Borough News of the 19th November 2008 a call to encourage residents to ensure that their views are submitted to the Council so that the Planning Committee is fully aware of their views and comment when the application is considered. We relayed the article in a post here. There was no news from Shaftesbury ward. Later, in December, I wrote to all the Councillors about our public meeting organised in January. 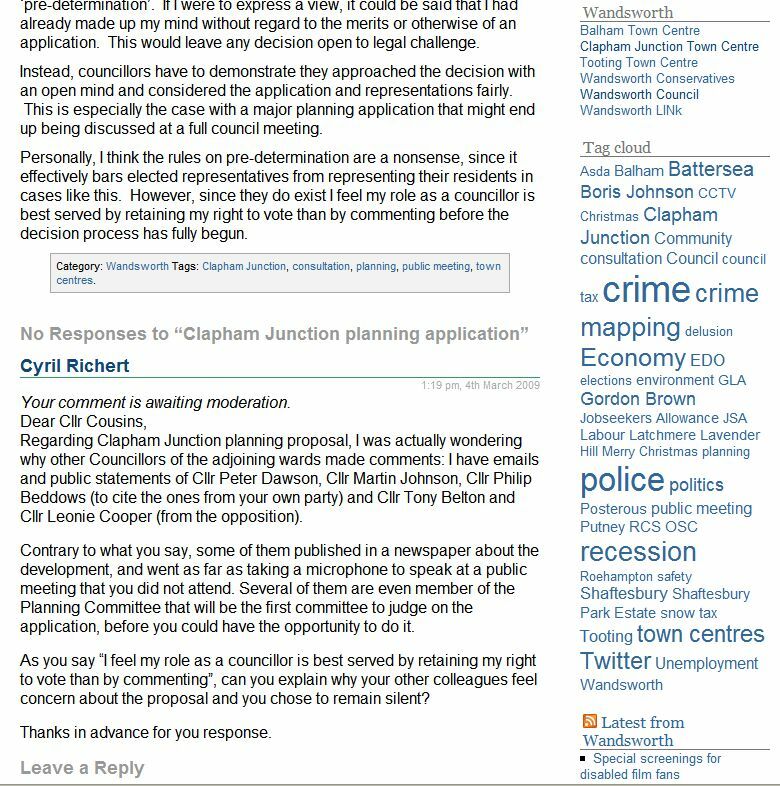 I received a nice response from Cllr Philip Beddows on the same day, telling me he intends to be at the meeting, cc’ing his two colleagues from Northcote Road. Later in this same evening, I received another email from Cllr Peter Dawson, confirming that the date of the public meeting was in his diary and requesting information. Regarding Latchmere ward, Tony Belton contacted me on the 14th November spontaneously after receiving my leaflet, and we met later after exchanging several emails. And on the same day of December when I received emails from the Councillors of Northcote ward, Cllr Leonie Cooper contacted me offering her help. In addition, you must know that, albeit fully aware of the need for the members of the Planning Committee not to pre-determine the decision, I asked the majority of the Council to provide a speaker to answer general queries about the plan and regretted the silence of the Councillors of Shaftesbury ward. Following the public meeting organised on the 28th of February, I did not see any of you (yes, Cllr Ellis said that he was there, but apparently he couldn’t hear despite the microphones as he did not notice when I clearly deplored – before Cllr Johnson spoke – that no news had been recieved from the Shaftesbury ward councillors). I was concerned to read in Cllr Cousins and Cllr Ellis’ emails a few days later that they think members of the Council have to remain silent – which was clearly not shared by their colleagues from the adjoining wards. When I emailed all of you (twice) regarding recent consequences of road planning, I received a specific response from Latchmere ward and very detailed (email and phone conversation) from Northcote ward…. and from Shaftesbury: just emails to forward to Cllr Senior (from whom I am still awaiting a response). I am trying to understand the reasons why issues of the constituents are not addressed the same way in your ward (my ward) as they are in the other wards. I would really appreciate if you could actually explain the situation and I remain available should you want to discuss more. Thank you for your further email. As was stated quite clearly in my email of 30 January, I have replied to all letters and emails from constituents about this particular development proposal. All comments, including your own, will be taken into consideration if I am required to vote on this application. Whenever there is a planning application, no matter how large or small, a full consultation and residents are encouraged to write to the Planning Department to give their views, and this proposal is no exception. The guidelines regarding predetermination have been explained to you on a number of occasions; if others chose to ignore them and run the risk they are precluded from voting that is a matter for them. I note the criticism on Paul Ellis’ colleagues: Cllrs Johnson, Beddows, Dawson, Belton and Cooper, who should better adopt his “objective” posture. Surely they will appreciate and the constituents too. His previous letter can be seen here with comments about the real meaning of pre-determination. Unfortunately I am working away from home and cannot give it the time it deserves until the weekend so I hope you will forgive a delay in a full reply. However, to give a brief response. For a major decision which might go to full council you are well aware of the need for councillors to avoid pre-determination. I recognise other councillors have spoken out, but personally feel they have gone too far. I am not sure how much you know of the ‘reasonable man’ in English law, but I would suspect, for example, that a reasonable man would view Cllr Belton’s comments featured on your video as pre-determination. The stance is clearly down to the individual councillor. I am not qualified to comment on where the line is drawn, and therefore, on this subject, I would prefer not to take the risk of pre-determination. I would hope you can understand and respect that decision. Update 09 March: Further reply from James Cousins. Further to my original email, my apologies I could not write more fully at the time, but my thanks for allowing me the opportunity to clear up your misunderstanding. Having had the opportunity to more fully read through your emails I am not sure how much more I can add. I understan you believe my actions have caused concerns among local residents. But this is not an analysis I can share. I believe that I am one of the more accessible councillors and am always happy to engage in a constructive dialogue with residents. On this subject I have corresponded with a number of people who have approached me in a variety of ways. On each occasion I have replied, detailing my interpretation of pre-determination and assisted as far as I can, encouraging them to make their representations to the planning department (as well as detailing how they can do this) and on at least one occasion liaising with the planning department to provide more details. With regard to pre-determination I am afraid you have misinterpreted my initial email, perhaps because I was not clear enough. It is for each councillor to judge their own actions on pre-determination, these may be challenged on appeal. Personally, I prefer not to take the risk. It is for other councillors to decide how far they are prepared to go. Your attempt to suggest that my feeling that Cllr Belton’s remarks are further than I would like to go is politically motivated is, unfortunately, very wide of the mark. Cllr Belton and I have a lot of political differences, as I am sure he would confirm, but this is not one of them.